Like all sporting breeds, Vizslas require a good deal of exercise to remain healthy and happy. A bored Viszla is a destructive Viszla who is likely to engage in unwanted behaviour, including chewing anything and everything in your home. Thirty minutes to an hour of exercise daily in a large off-leash area is optimal. There are two prevailing theories pertaining to the Vizsla's history. 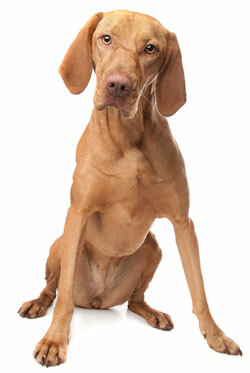 The first, and most prevalent theory traces the Vizsla back to very early times in Hungarian history. Ancestors of today's Vizsla were the hunting dogs used by the Magyar tribes living in the Carpathian Basin in the Eighth Century. The other theory holds that the Vizsla is a product of the past century, having been the product of Weimaraners and other pointer breeds. Vizslas are often mistaken for ridge less Rhodesian Ridgebacks, and physically likened to Weimaraners, their German cousins.